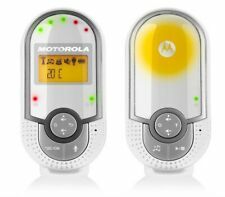 Motorola MBP16 Wireless Digital Baby Monitor. Motorola MBP16 Digital Audio Monitor with LCD Display. It also includes a room temperature monitor for safety and peace of mind. The Motorola MBP16 encrypts the audio data it transfers for added security and peace of mind. Features a high sensitivity microphone to hear every peep, and the range of up to 1000 feet allows you to keep. in touch from anywhere in the house. 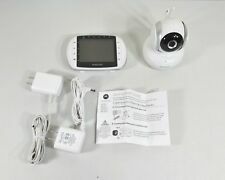 Motorola 2" Video Baby Monitor. Monitor what matters. Help your little one sleep soundly with the Motorola Smart Nursery Dream Machine. With Motorola's Smart Nursery Dream Machine, your nursery just got smarter. W E HAVE DESCRIBED THIS ITEM TO BEST OF OUR KNOWLEDGE INCLUDING ALL KNOWN AND VISIBLE FLAWS. Overall in excellent condition. Wireless Technology: 2.4 GHz FHSS. Motorola MBP48. Infrared Night Vision. Visual Sound Level Indicator. When being used in battery mode, the screen will go blank after two minutes of inactivity, at which point the unit enters a power saving mode. New! Motorola 2.8" Video Baby Monitor With Wi-Fi MBP667CONNECT Ships Free. Condition is New. Use with Model MBP19. Infrared Night Vision. Motorola MBP26 Digital Video Monitor. Data encryption is built-in for added security. An alarm sounds when you're getting out of range of the transmitting unit, so you'll never have to wonder if you're close enough to hear what's going on. USED IN GOOD CONDITION.SHOWS WEAR FROM CASUAL USAGE. Sound, Motion, and Temperature Notifications. Wireless Technology: 2.4 GHz FHSS (for Local Viewing) Wireless Connectivity (for Remote Viewing) - Requires wireless connection to the internet and acompatible viewing device. This Motorola 3.5" Video Baby Monitor enables you to always keep an eye on things. Rest assured that they are always safe and sound with digital zoom and infrared night vision for keeping an eye on things in very low light levels. The MBP27T has infrared night vision, so even in a darkened nursery, you can see your baby clearly. A built-in temperature sensor allows you to take the temperatures of baby or a bottle. The superior wireless range of the MBP27T lets you keep connected to the action up to 520 feet away. Remote Pan, Tilt and Zoom. Infrared Night Vision and High Sensitivity Microphone. Wireless technology. -2.4" diagonal color screen. Up to 1000ft Range ( Any obstruction between parent and baby units will reduce the range significantly) LED Sound Level Indicator, Out-of-Range and Low Battery Alerts. 2" Video Baby Monitor. Wireless Technology. Diagonal Color Screen. Up To 1000ft Range. Brand New! Never used star grip, no box. Fits onto many. model options and works great for mounting a monitor almost anywhere! Motorola MBP35XLC Video Baby Monitor. Enjoy peace of mind with the Motorola MBP35XLC video baby monitor, utilising a great range of features to keep you reassured while your baby is sleeping peacefully in their cot or playing in their room and allowing you to go about your daily activities in the house.Portable Display. Remote Pan, Tilt, and Zoom, Two-Way Communication, Room Temperature Display, Infrared Night Vision, High Sensitivity Microphone, and 5 Lullabies. Remote HD (720p) Video Streaming. With Hubble Connected App, View on Compatible Smartphones, Tablets, and Computers. Portable baby monitor with added Wi-Fi connectivity. Can connect with Hubble App to your smartphone or tablet. Motorola MBP36BU Additional Camera for Motorola MBP33 / MBP36 Baby Monitor. Condition is Used. Shipped with USPS Priority Mail. Overall in excellent condition. LED Sound Level Indicator, with Low Battery Alert. Wireless Technology: 2.4 GHz FHSS. Due to the high amount of international fraud. New open box item. StarGrip Monitor Mount. The Hubble app allows you to receive sound, motion, and temperature notifications to your compatible viewing device so you can always stay connected to what’s going on. Digital zoom and infrared night vision. The night vision image in total darkness is acceptable at a distance of 4 to 5 feet. Can you cancel my order?. Occasionally orders may take longer. The night vision image in total darkness is acceptable at a distance of 4 to 5 feet. Motorola MBP33XL 3.5" Video Baby Monitor with Digital Zoom, Two-Way Audio ..
Help your little one sleep soundly with the Motorola Smart Nursery Dream Machine. Part of the Motorola Smart Nursery System-works with Smart Nursery 7, Cam, Humidifier and Mother and Baby Scale. Refer to the PDF attached below in Technical Specification for User Manual. Rest assured that your little one is always safe and sound with the Motorola 5" Portable Video Baby Monitor. Keep an eye on things with the ergonomic parent unit, which boasts a large 5" diagonal color screen, and clearly communicate with your partner or child using the two-way communication feature.